I’ve set some odd goals throughout my life. Goals that are a personal measure of my own success. One of those goals was to carry a Spyderco as an EDC knife. I always associated Spyderco with expensive and high quality. Why? I’m not exactly sure. Realizing that knives from companies like Microtech can cost 5 times as much as a Spyderco didn’t change my mind. To me a Spyderco was a measure of a certain kind of success. I had a bit of a rush when I finally purchased my first Spyderco. This is my third Spyderco and I get that same rush. The Spyderco we are talking about today is the Gayle Bradley Folder 2. The Spyderco Bradley Folder 2 has been my EDC for most of the fall and winter so I’ve had the time to get to know it. 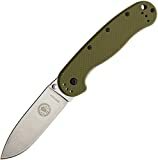 We all know who Spyderco is and we know they produce high quality knives designed for hard work. Gayle Bradley may be familiar to some readers, but let’s talk about him a bit for those who aren’t familiar with his work (we previously reviewed Bradley’s original collaboration with Spyderco, and the Spyderco Air as well). Gayle Bradley has been designing knives for over 30 years. His knives have set Blade Sports world records twice and stay in high demand. The calling card of his knives is the combination of form and function. Gayle Bradley’s knives work and look good doing it. The Spyderco Bradley Folder 2 is no different. The collaboration between Gayle Bradley and Spyderco has produced my favorite Spyderco yet. The Bradley Folder 2 has an overall length of 8.48 inches, has a 3.66-inch blade, weighs 4.5 ounces and is built in Taiwan. Since it has a 2 in the name you can assume this is the second Bradley and Spyderco collaboration. The Bradley Folder 2 is longer in both blade and handle than the original, but remains the lighter knife. The Bradley 2 is a half an ounce lighter than the original. This knife is too pretty for me. It’s so good-looking I almost hate to carry and abuse it. As you can see from the pictures I seemed to have gotten over that. I’ve used and abused it quite a bit. 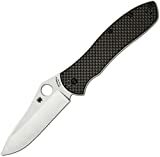 The handle features carbon fiber and G10 laminate grips. This gives the knife it’s eye catching outward appearance. It’s not until you spend some real time with this knife you appreciate it’s refinement. Once you get to third date you can take a peek under the skirt. The blade is hollow ground and the symmetry is painfully perfect. The way the grinds on the top of the blade catch the light is something you can only experience with one in your hand. The blade is made from CPM M4 steel. The benefits of this steel are numerous. It’s strong, it holds an edge forever, and it can be razor sharp with little effort. The knife gods can’t give without taking though. M4 is a tool steel and not a stainless steel so it will rust if you don’t take care of it. My blade isn’t rusted, that’s tar. I’ve been re roofing my home and the Bradley Folder 2 has been along for the ride. Once I have the time I’ll sit down with some blade oil and a stiff AP brush and try to clean it. For now, it just adds character. From the factory the blade is a razor. It sliced through any and everything with ease. Paper, roof shingles, cardboard, rope, and more. Dragging it over certain materials was enough to make cuts. I remain impressed by how sharp I can get this blade. Equally impressive is how long it remains sharp. The extended handle on the Bradley Folder 2 will be appreciated by anyone with XL hands. The design includes a subtle finger guard to help resist hand slippage when working hard. The rear of the handle has an inward curve that accommodates a thumb on top grip. The screws that hold the grip panels to the knife are countersunk and blackened to blend in with the grips. There is a total of 8 Torx screws in the grips, 4 on each side. That carbon fiber pattern offers you a grippy texture. It helps keep the knife in your hand, but isn’t abrasive or uncomfortable. The pattern itself is not just nice to look at, but functional. The back of the blade has a small textured session to rest your thumb on. It’s nice but it could be bigger. There is plenty of room to extend the texturing if they chose to do so. The blade is easy to control for fine cuts and the handle is comfortable during long stretches of work. Included is a simple, but long pocket clip. It’s 2.5 inches long and adorned with a cute little Spider. The pocket clip can be moved to 4 different positions. You can carry the knife tip up or tip down and it can be orientated for left or right handed carry. The Bradley Folder 2 is a completely ambidextrous knife. The Bradley Folder 2 has a larger ½ inch deployment hole. When it comes to Spyderco’s deployment hole design you either love it or hate it. For me it’s easy to reach and puts the blade into action fast enough. It’s far from the fastest deployment system, but its smooth and reliable. There isn’t a little piece of metal screwed to the side of the blade that’s waiting to fall off. Once the blade is locked in place it’s staying there. The blade has zero play in any direction. You can feel the slight hiccup right before the liner lock engages. This the only point where deployment isn’t 100% smooth. The liner locked is textured which is a nice touch. This makes it easier to unlock the knife, especially when your hands are cold and numb. The Gayle Bradley Folder 2 is a great little knife. It mixes both form and function flawlessly. It gives users something they can admire with the hand and the eye. The Bradley Folder 2 is a workhorse. Just because it’s pretty doesn’t mean it can’t get dirty. This isn’t the cheapest Spyderco, and you are probably paying a little extra for the looks. Are looks worth it? Well, that’s subjective. To me, it’s worth every dime. I think it’s a fantastic knife and it will likely stay in the carry rotation for some time. 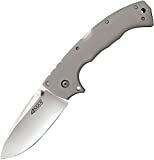 Editor: I recommend purchasing the Spyderco Bradley Folder 2 at Amazon.com and BladeHQ. Please consider that buying anything through any of the links on this website helps support BladeReviews.com, and keeps the site going. As always, any and all support is greatly appreciated. Thank you very much.